What Goals did you start with? Remind yourself why you chose certain goals; was your goal to train for a specific race or be able to run a certain distance? Remembering why you chose an activity and returning to the ENJOYMENT can help restore your focus! Did you set short- or long-term goals? If you set a goal to be able to run a marathon without short-term achievements, you may have set yourself up for failure. Setting smaller targets keep you feeling optimistic and make the journey to your long-term goal feel less monumental. Remember the acronym SMART? Review your goals and do a double-check, comparing them to SMART (Specific, Measurable, Achievable, Realistic, Timely). Perhaps you didn’t provide yourself with measurable goals—its not too late to make revisions; there is no need to simply give up. Lofty physical fitness goals should not have an “All or Nothing” focus. 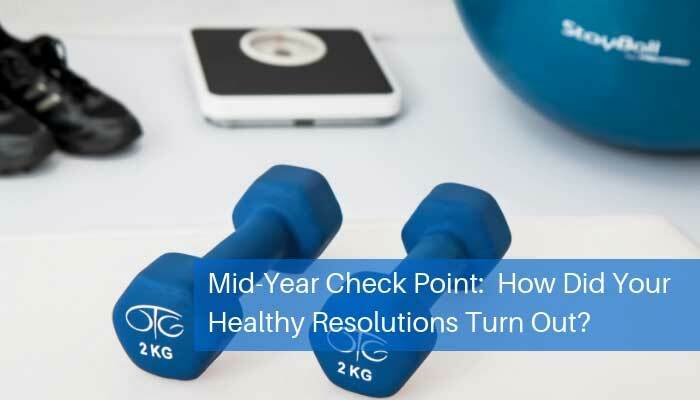 Discover new methods to reach those goals and instead of quitting, consider that you are at a point (mid-year) that a revitalization may be all you need to get there (you still have several months left!). Did you overwhelm yourself with too many resolutions? Statistics show while 45% of people make resolutions, only 8% are successful. You don’t have to reach every single goal you have set for yourself, especially if you look back and think “This must have been a dare—I cannot possibly reach ALL of these!” Downsize and focus on the ones you have found most enjoyable or provided the best results; these are the goals you have the best chance of reaching. What have been your obstacles and how can you overcome them? If you look back and see that there have been difficult circumstances which are preventing you from maintaining your routine, note ways you can avoid them (or methods to quash them). Perhaps modifying your exercise routine to schedule a day of rest or a shorter workout on days when your schedule is busier. Or, you can focus on your respiratory workouts on days when you simply cannot fit a workout in or are sore. Don’t discount the benefits of better breathing for your overall health goals! Two 10-minute workouts with your Powerlung device can not only help you maintain your respiratory function, but provide that satisfaction that, even though you couldn’t squeeze in your workout, you are still exercising! Increase your odds to finish the year strong. Enlist a friend who may be in the same boat as you. There is no need to be embarrassed that you haven’t come as close to reaching your goals as you’d planned. You are only human and because of this, that human connection can really increase your odds of reaching your goals. Either work out together, share your exercise experiences, or simply be accountable to each other. Check Up, But Don’t Check Out! So, sit down and review your resolutions. Hopefully you recorded them so you can really look at what you had in mind in January. Look for ways to reward yourself for achievements, understand how you can achieve your goals, and revise those which were not truly achievable. Don’t forget to count your Powerlung respiratory training as a workout on days you simply can’t squeeze your exercise in. And last of all—forgive yourself when you can’t achieve each individual goal on time. Goals, like a race, are reached in steps!